Queen duvet cover (88" x 88") featuring the image "End Of Light" by Kevin Smith. Our soft microfiber duvet covers are hand sewn and include a hidden zipper for easy washing and assembly. Your selected image is printed on the top surface with a soft white surface underneath. All duvet covers are machine washable with cold water and a mild detergent. Oooh, nice. Congrats on the sale! Kevin Congrats on your sale great work!! 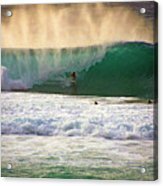 Gorgeous image, Kevin ~ congratulations on your sale ! Very Dramatic image with impact. Congratulations on a well-deserved sale! Nice shot Kevin! Congratulations on your $ale! Very interestin cpature with the backlit mist! Well done! Great shot! The glowing mist is a bonus on an already wonderful photograph. Banzai Pipeline. Only the expert should attempt surfing this wave. Considered one of the most dangerous of Oahu's north shore Pipeline is often called the world's deadliest wave, since more surfers have died here than at any other surf spot. Pipeline attracts athletes world wide for its annual professional surfing championships. 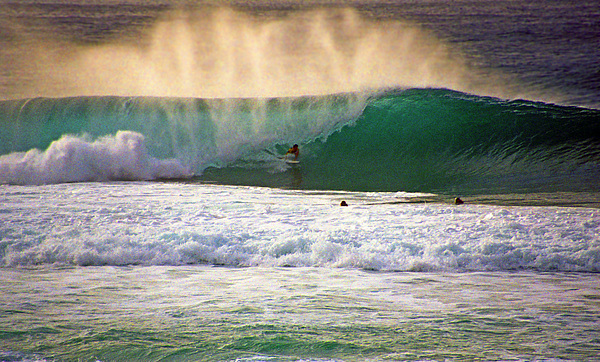 Seen here is 2006 Pipeline Masters Champion Andy Irons who sadly passed away November 2nd 2010 at age 32.